Port Warehouses, then, occupied number 428 Greenwich St. as well as the adjacent half of 430-436 Greenwich St., which left this sign with the range 428 to 432 Greenwich. This is a somewhat unusual occurrence. I don't know where I have seen it elsewhere. The company itself first appears in the New York telephone directory in 1922, and they stayed in business in what is now the TriBeCa area of New York until the late 1980s. Interestingly, their locations in city directories were never on Greenwich St. however, until the early 1950s. The 1922 telephone directory listed them at nearby 54 Laight St. Somewhat later (1928) they were listed at 41 Vestry St. in addition to the Laight St. address. These addresses remained consistent through 1943. Then the Vestry St. address became 47 Vestry St. Probably Port Warehouses were initially at 54 Laight St., then over time expanded its operations, first to 41 Vestry St., then 47 Vestry St., and finally to the other side of Greenwich St. at nos. 428-432. 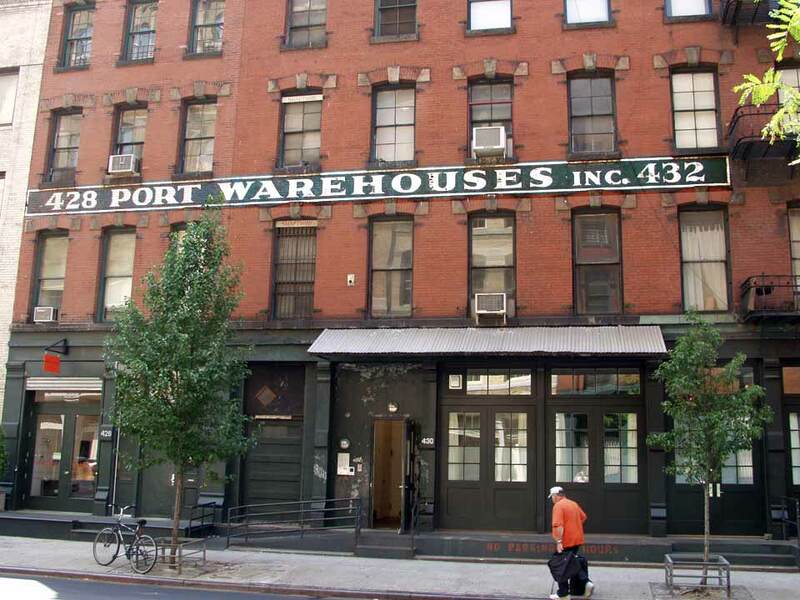 The Tribeca Landmarks Designation report repeats the phrase, "became a facility of Port Warehouse's extensive operation in the area," for each of these buildings in turn. Port Warehouses were founded by Campbell Clark Groel (1886-1953), a New Jersey native born Newark, NJ, 30 Sept. 1886. The yearbook, Olla Podrida, for the Lawrenceville School, in Lawrenceville, New Jersey, listed him as a student in 1907. In 1909 a Newark city directory listed him as a clerk at George A. Ohl Co., machine works, in Newark. The 1910 U. S. Census recorded him living at 114 Cleveland St., Orange, NJ, when his occupation was "machinist in factory." Then in 1917 he registered for the World War I draft, age 30, when he was employed as a "warehouseman, Mercantile Warehouse Co., New York City." In 1920 a publication called The Bean-Bag ("Exclusive Bean Publication of the World") reported, "C. C. Groel and H. B. Gehring have organized the Warehouse Brokerage Co., Inc., located at 105 Hudson St., N. Y. The object is to furnish a service in connection with warehousing that assures the merchant of a proper protection and supervision of his interests. The Warehouse Brokerage Co., Inc., represent 24 warehouses in the port of New York offering 1 1/2 million square feet of storage space both bonded and free. Their service costs the merchant nothing as they derive a small commission from the warehouses on all goods placed in storage through them. ... Both Mr. Groel and Mr. Gehring through their connections with the Mercantile Warehouse Co. and Coastwise Warehouses, Inc., respectively, are in a good position to give efficient service in their venture." On his death in 1953 the following death notice appeared in the New York Times, 14 August 1953, pg. 19, "Groel - Campbell C., on Aug. 12, 1953, beloved husband of Grace Miller Groel of 291 Elmwynd Drive, Orange, N. J., father of Campbell C. Groel Jr. Service at The Colonial Home, 132 South Harrison St., East Orange, N. J., Friday afternoon, Aug. 14, at 3 o'clock." Campbell C. Groel was succeeded in the business by his son, Campbell C. Groel, Jr. (1914-2005). On his death in 2005 the following obituary appeared in the New York Times, 14 August 2005, "GROEL--Campbell Clark Jr. Of Vero Beach and Martha's Vineyard, died on August 11, 2005, in Royal Palm Convalescent Center, Vero Beach, FL, after a brief illness. He was born February 16, 1914, in Orange, NJ. Campbell was a graduate of Lawrenceville Academy and Princeton University class of 1936. Shortly after graduation from college he joined the Army and obtained the rank of Captain while piloting transport planes over ''The Hump'' to China. After his military service he joined his father in the family business, ''Port Warehouse,'' based in the Tribeca section of New York City. This led to a long and successful career in real estate investments until his retirement in 1986. He never lost his love of flying and piloted private planes until he was 82. Surviving are his wife of 22 years, Eleanor Groel of Vero Beach and Martha's Vineyard; stepsons, Don Reese, Hunter Corbin and Peter Corbin; stepdaughter, Sally R. Anderson; seven grandchildren and five great-grandchildren. He was preceded in death by his first wife Elizabeth M. Corbin in 1981. In lieu of flowers the family would appreciate donations to your favorite charity in Campbell's memory. For information, contact Strunk Funeral Home, Vero Beach." Campbell C. Groel Sr. was the third generation descendant of Adam H. Groel (1834-1874), an immigrant from Germany, and a tinsmith and dealer in stoves in Newark, NJ. His son, Adam Henry Groel (1861-1928) was Campbell C. Groel Sr.'s father. Adam Groel Sr. appears in several tax assessment lists from Newark during the Civil War. One such from 1865 recorded taxes amounting to $1.85 and $1.50 for two different grades of tin plate. This ad for the senior Adam Groel, Stoves & Ranges, appeared in Gopsill's Newark City Directory for 1865-6. Adam H. Groel Jr. appears in the 1880 U. S. Census, age 19, living with his widowed mother on Webster Street in Newark. His occupation was bookkeeper, and he was listed in a succession of Newark city directories in the 1880s as a bookkeeper at the Clark Thread Company in that city. Later, when living in Orange, NJ, he worked for the Clark Mile End Thread Company located in Kearny, NJ.